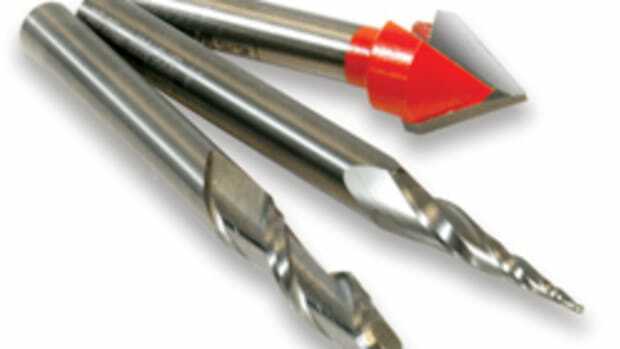 The concept of computers controlling a cutting or milling head in X, Y and Z planes originated just after World War II and by the 1980s there were a number of small machines and DIY kits available. 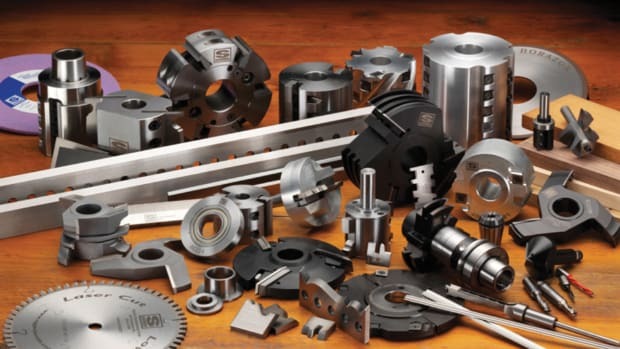 With the growth of personal computing, CNC really took off and during the next few decades it evolved into the huge, sophisticated work platforms we see today. But in the last few years, several manufacturers have recognized the need for small machines that can handle anything from scribing and scoring to additive technologies (3-D printing). That market is defined by small shops that are looking at entry-level equipment; schools and colleges that want to introduce students to CAD and CAM programs; and larger shops that either don’t want to dedicate a big machine to a minor task or else wish to explore the possibility of new technologies on a smaller, experimental scale. One way that manufacturers control cost on desktop units is to substitute over-the-counter routers for spindles, just as they did with the very first machines. Today, some CNC setups even come without the router. 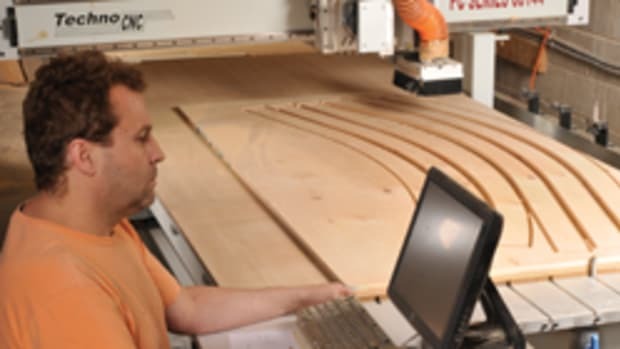 For example, Axiom Precision (axiomprecision.com) offers an entry-level machine that delivers “maximum performance with a minimum footprint.” The company’s Hobby Series accepts the Bosch Colt router. Larger Axiom desktop models require a standard 3-1/2” router or else they are equipped with a spindle. The line ranges from the 12” x 12” Hobby to the servo-driven 48” x 48” Elite, which can travel at up to 320 inches per minute (IPM), has a full 8” of Z range and is built around a 3-hp electro-spindle that has integrated liquid cooling. 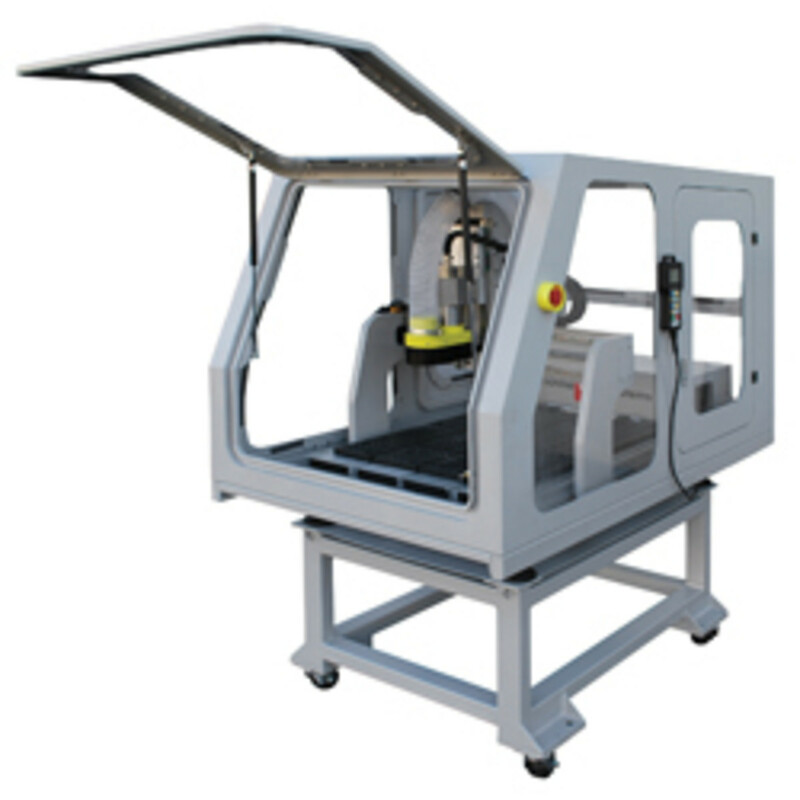 Techno CNC Systems LLC (technocnc.com) recently introduced the HD II 2436, a compact version of a full-scale CNC router system that is ideal for both production and education tasks. That’s because it’s available with an optional safety enclosure and stand that can be easily transported from one room to another. It has a 24” x 36” process area and comes with precision ball screws on all three axes. Brushless micro stepper motors move the 2-hp high-frequency collet spindle and the table is set up for both vacuum and T-slot. In addition, the HD II 2436 comes with a hand-held controller, 7-1/2” gantry clearance and a 9-1/2” Z-axis stroke. Also available is a fourth-axis rotary table and tool kits. ShopBot Tools (shopbottools.com) offers a flexible platform to support growing digital fabrication interests and needs. 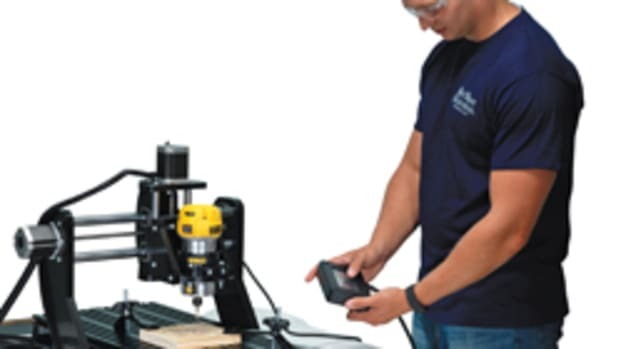 The ShopBot Desktop can be ordered with a Porter-Cable 2-1/4-hp router or an industrial 1-hp HSD spindle. XYZ movement is 24” x 18” x 5.5” and the gantry frame is welded aluminum with a removable aluminum T-slot deck. The cut speed is 240 IPM and it runs on household current. Schools in particular might also want to check out the Desktop Mini Enclosure, which is an acrylic guard that keeps fingers out and dust in. And ShopBot just released the new Desktop Max with a larger (36” x 24”) work bed. “The ShopBot Desktop Max was inspired by our customers,” ShopBot marketing director Jeanne Taylor says. 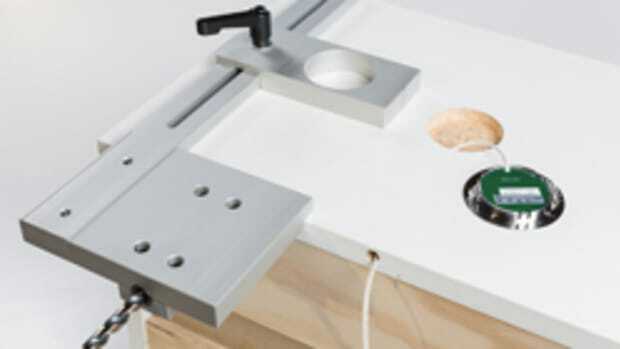 “This new tool makes it easy to fit items such as guitars, chair and table parts, cabinetry parts and more, onto the bed.” It comes with one of two bed options — an aluminum deck or a plenum with a universal hold-down system, which eliminates the need for screws, adhesives or clamps for holding large sheet goods in place. The Desktop Max also features a dual-motor gantry design. Laguna Tools (lagunatools.com) offers three 24” x 36” desktop models. The IQ is designed for prototyping and small production runs and features an industrial-grade, liquid-cooled electro-spindle. The IQ L4F adds the ability to route, probe, turn and 3-D print. And the IQ PRO adds a more powerful hand-held control that allows for tool-path previewing, plus a three-position automatic tool changer. Next Wave Automation (nextwaveautomation.com) offers the Piranha and Shark desktops. 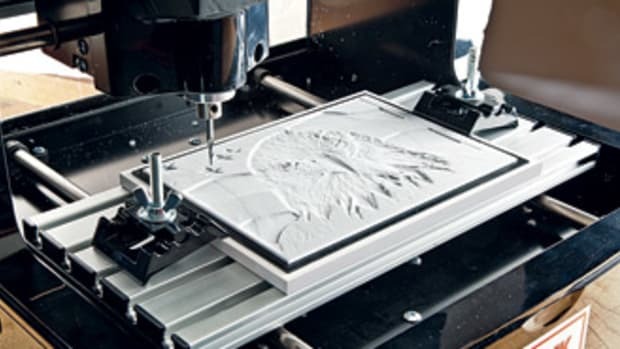 The Piranha XL has a 12’’ x 24’’ cutting area and comes with a 3-D model library and VCarve Desktop V8. That’s a design software program for a PC computer and it allows a woodworker to save the program to a USB flash drive and plug it in so the computer doesn’t need to be in a dusty shop environment. The Shark HD4 features a heavy-duty gantry reinforced with plate aluminum, and a rigid interlocking aluminum table. It is built to handle 2-1/4-hp routers or a water-cooled spindle. It features adjustable bearings to give more stability during heavy cutting. Included are VCarve Pro V8 Design software, Vector Art 3-D Sampler Pack, CNC Shark control software 3.0 and in some configurations, Virtual Zero software that maps the surface of the table or workpiece and uses the map as a dynamic reference point. This eliminates problems caused by warped or bowed workpieces and small inconsistencies in the table. It also allows you to carve and machine stock that is intentionally convex to begin with. 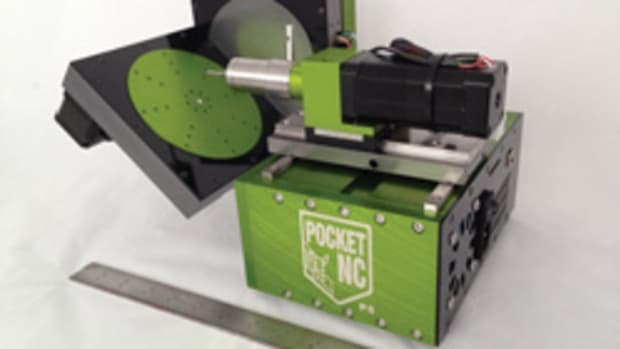 A new electronics package expands the capabilities of the CNC Shark and allows attachments like laser, 3-D printer, fourth axis and water-cooled spindle control. 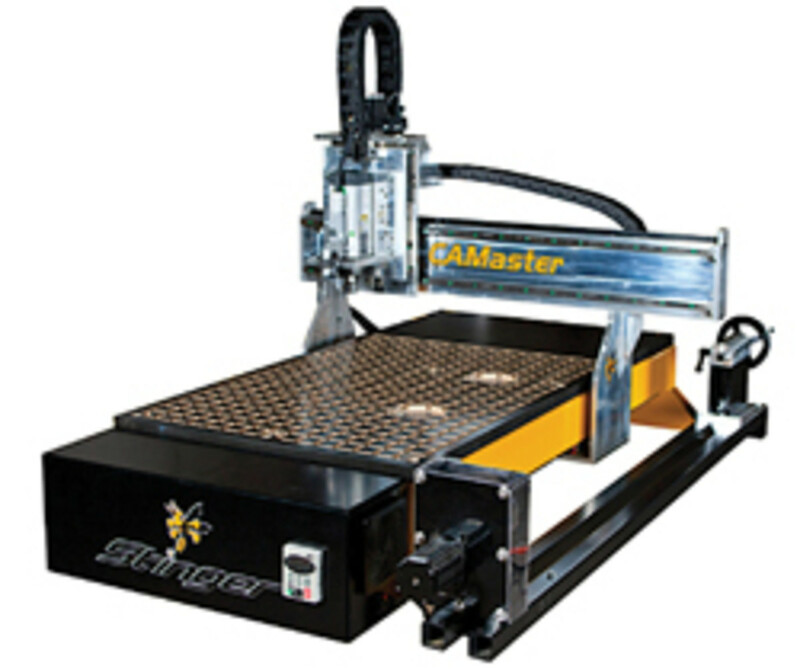 CAMaster (camaster.com) offers its Stinger model with 2’ x 3’ and 2’ x 4’ tables. Constructed on a welded steel frame, the Stinger has industrial quality rails and bearings and is shipped completely built and tested. Each Stinger comes with a control PC that runs Windows 7 Pro and has a 19’’ flat-panel monitor. The Stinger also comes with Vectric’s Cut 2-D design software. ShopSabre’s (shopsabre.com) recently introduced the ShopSabrel 23, which incorporates a control system powered by WinCNC and “is perfect for educational settings, hobbyist shops and startup companies where a larger machine is not an option,” according to the company. It has a 30’’ x 40’’ cut area, and 5’’ of Z clearance. Digital Wood Carver (digitalwoodcarver.com) offers an array of entry-level desktop CNC machines, software and tooling. The basic model has a 40’’ x 24’’ bed, with the ability to add a fourth axis. 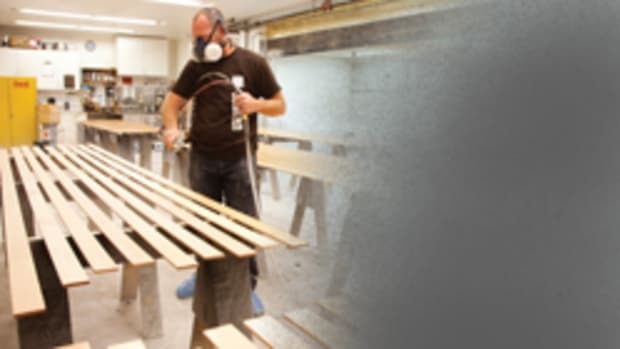 CarveWright (carvewright.com) desktops are available from Rockler in five configurations, the largest for projects up to 12’ long and 14-1/2” wide. The smallest desktop unit from Velox CNC (veloxcncrouters.com) is the VR-2525, so named because the machine’s travel is 28” x 28” x 8” (Z clearance is 6”). It runs with a 3-1/2-hp Porter-Cable model 7518 router. Intelitek (intelitek.com) is a company that brings technology to classrooms and its small desktop CNC, the BenchMill 6000, is a PC-based machining center designed for advanced manufacturing instruction. 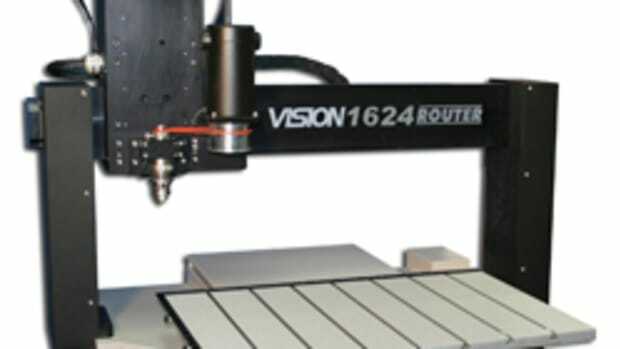 The 1624R CNC desktop router from Vision Engravers (visionengravers.com) has a 16” x 24” aluminum T-slot table to accommodate various work-holding fixtures, a red laser pointer for easy job setup, a Series 4 Controller with a hand-held pendant and optional Raster Braille inserter for sign making and oscillating knife for cutting semi-rigid materials. 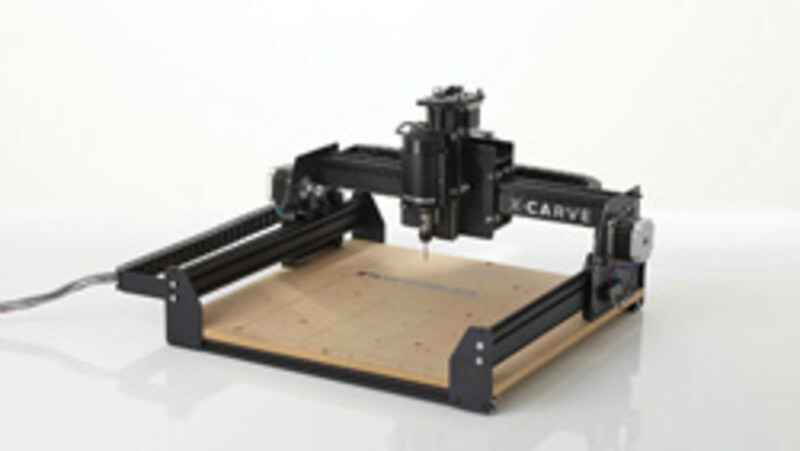 Woodworkers who like to build their own machines will enjoy a visit to the X-Carve site (inventables.com/technologies/x-carve), where three incredibly basic nuts and bolts models are available. The beds are roughly 20” x 20”, 30” x 30” and 40” x 40”. This is a learning experience rather than a doorway to large-scale production. The Chicago-based company, Inventables, has a stated goal of trying to ignite a revolution in digital fabrication. To see what’s coming down the pike in terms of new desktop CNC routers, do a search on kickstarter.com. It’s a fundraising site where new entrepreneurs go to find financing for their inventions. Having been born and raised in Ireland, I can honestly say that a good jig — musical or woodshop — always lightens my heart. And here’s one that any casework installer will like.